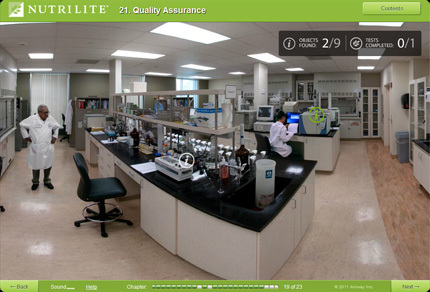 Purpose: Development of e-learning course providing virtual access to the entire complex of agricultural, lab and production facilities, with integrated study activities and section quizzes. 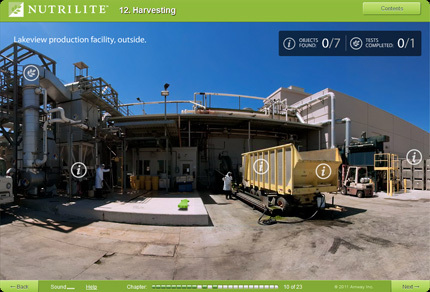 This interactive tour was developed for sales personnel, to provide them with in-depth information about the company, its high production standards, and competitive benefits. 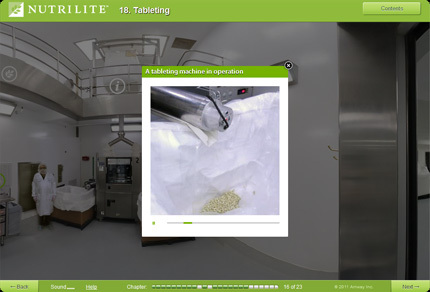 The project was designed as an interactive quest over the entire production cycle: from growing to harvesting and extraction, through testing to tableting and packaging. Video spots and directional sound technologies were utilized to enhance the immersion of the learning process. Benefits: Access to company facilities for a vast amount of its sales people, instead of a select few as was the case before. Reported better product knowledge, increased sales figures, and connection to the company values and goals. Increased time spent on active learning and high satisfaction with this tool indicated via the feedback system. 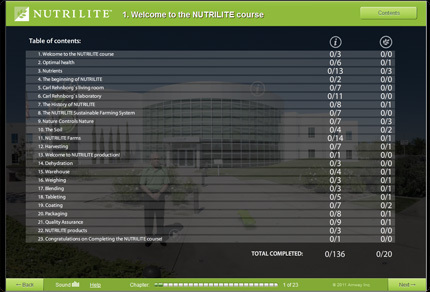 The tour is structured in accordance with the actual tour available for a very few select employees who are awarded a trip to Nutrilite HQ in Los Angeles. and it is guided by the most legendary people of the company. 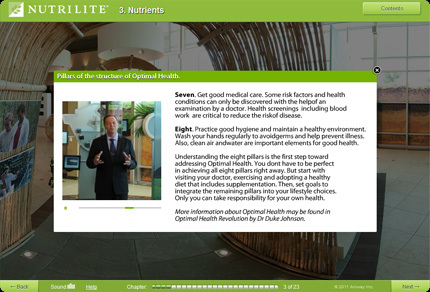 Contents menu in the top right corner helps to navigate and track successful completion of the chapters. (i) - information hotspots that contain useful data on the company philosophy and manufacturing practices. (leaf) - quiz questions that verify understanding of the subjects touched upon in the current chapter. 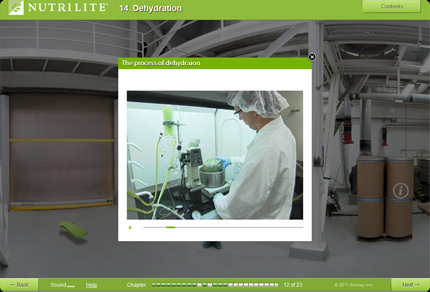 Company information is provided in various forms: text, images, animations, video materials, - to keep the learning process interactive and fun. 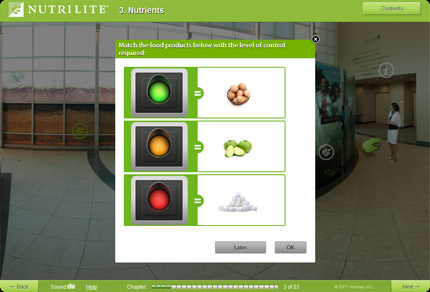 To proceed to the next chapter employees must answer the quiz questions correctly. In this demo version however, we have lifted the restrictions and registrations, so you could explore the tour in its entirety without having to provide correct answers for each quiz. 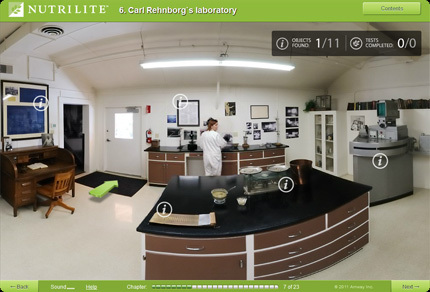 The tour takes you to the place where the company was born, to the house where Carl Rehnborg has created the first multi-vitamin blend in the US. 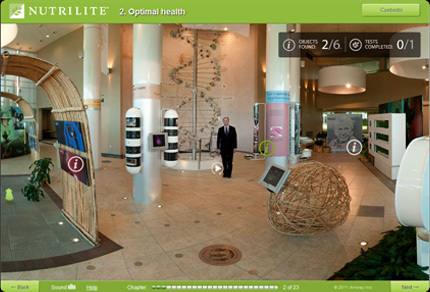 Nutrilite preserved the interiors of the first lab and living quarters. Many of the objects from those times are still there where they originally belonged to. 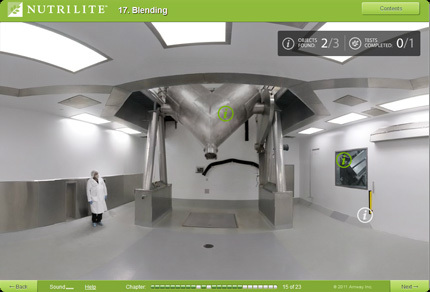 Click and explore the world of the first multi-vitamin lab in the US and the original tools involved in vitamins manufacturing: from scythe to the tablet press. 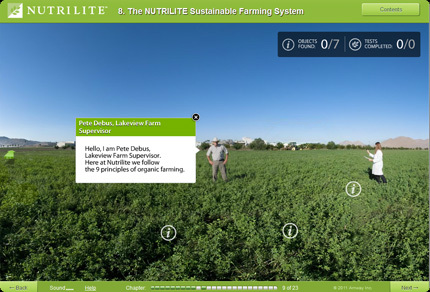 The tour goes on through the fields of organic ingredients to the harvesting facilities. Several chapters take you to the production process. These are the special paces off limits to most of the public. Everything is medical-grade here and everyone in the production are completely suited up: from shoe-covers to masks and hair caps. Employees learn about the custom-built equipment, get more "mass" and more understanding of what goes into the production process and what makes their products so unique. 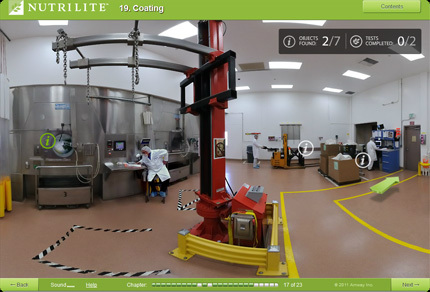 From blending and tableting... to drying, coating, and packaging. 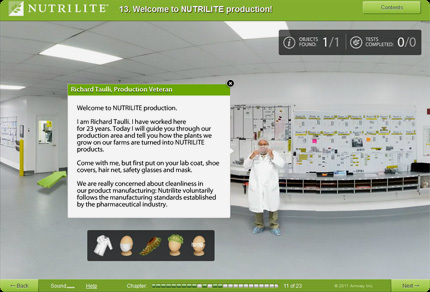 The tour also demonstrates rigorous tests that each batch of product is subjected to, to ensure only the highest quality vitamin supplements are packaged under Nutrilite brand. 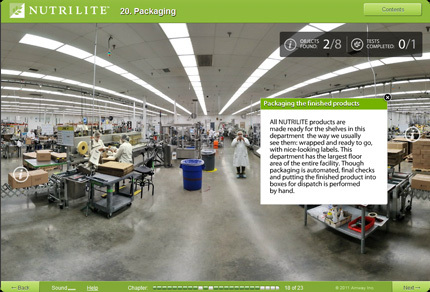 Packaging facility with 10+ conveyor belts working non-stop to fulfill orders for different countries gives a sense of international outreach and the scale of the Nutrilite operation. 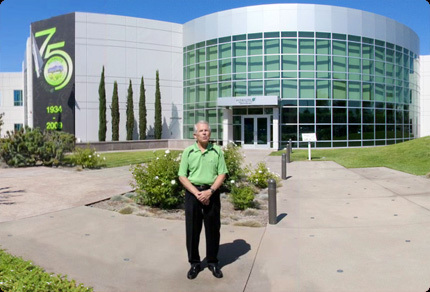 State-of-the-art product testing laboratories complex is equipped with some of the most advanced scientific analysis tools available on this planet, including the 6,000 C plasma spectrometer. Over 15,000 tests are being conducted here monthly to ensure only quality ingredients are used. 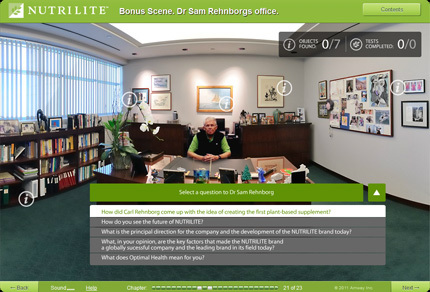 At the end of the tour, if you have completed all the quizes and scored 80%+ you get a chance to visit Dr.Rehnborg's office and ask the founder's son some questions about the company and his vision for it. *To get there click NEXT-> in the bottom-right corner at Scene #22. The tour consisted of three floors to explore, with interactive virtual walkthroughs and details on each floor. Similar to our other tours, the Macy’s virtual prototype store was a very intense visual merchandising project that we managed to accomplish in only two weeks. Audio, animation and video effects on "mouse-overs"
Amazing degree of interaction between the project and customers. 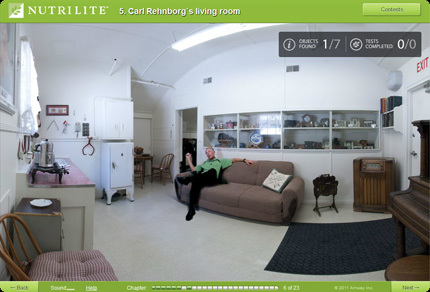 * Unlike video tours that force-feed visitors and cause you to loose interaction with your potential customers, the best virtual tours - our WOW Tours keep them engaged. Our projects show a much higher retention value. The visitors explore your project at their own pace, often spending 30+ minutes on your site and enjoying the process. e-learning technology on this planet.